Sugar tax: Are Mexicans the fattest people in the world? Claim: Mexicans are the fattest people in the world. Verdict: Out of the OECD countries, Mexico has the second highest rate of obesity, the United States is first. Dr Michael Mosley in an interview on the BBC's Today programme, said that people in Mexico are the "fattest in the world". He was discussing the introduction of a new tax on sugary drinks in the UK. Mexico introduced a similar tax in 2014 to combat its growing obesity problem. But is it the "fattest"? One way to find out is by comparing obesity rates around the world - measured by a person's Body Mass Index (BMI). An obese person is defined as someone with a high proportion of body fat and a BMI of over 30. According to the Organisation for Economic Co-operation and Development (OECD), made up of 35 major economies, the US is the most obese country, where 38.2% of the population over the age of 15 is obese. Mexico is second with 32.4% of the population and New Zealand is third with 30.7%. 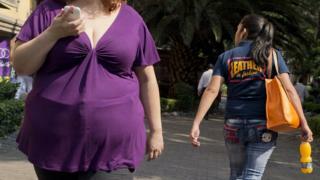 In Mexico, obesity rates are higher among women than men. The OECD average is 19.5%. The OECD works out the BMI for different countries using estimates of height and weight from surveys and "measured" data based on estimates of height and weight from health examinations. Long-term projections suggest obesity levels are expected to rise in Mexico until 2030, as they are in countries including the US, England, Canada, France and Spain. The World Health Organization (WHO) and Imperial College London conducted a different study on obesity in 200 countries. The region with the highest rate of obesity among adults is American Samoa, followed by other islands in the South Pacific. Mexico is only 40th and the US is 30th. The study pooled together surveys from national heath ministries to produce estimates for levels of obesity. While areas like American Samoa and the Cook Islands have a higher proportion of obese people, they have tiny populations so do not account for much of the total number of the world's obese people. In 2014, more than half lived in 10 countries including Mexico, the United States, China, Brazil and Germany. The number of obese children and adolescents (five to 19-year-olds) grew rapidly in the last four decades, according to the WHO. Nauru island has the highest rate of obese children. It rose from 16.4% to 33.4% between 1975 and 2016. About 13% of Mexican children are obese and 35% are classified as overweight. Outside the Polynesian and Micronesian islands, countries with the highest rates of overweight children and adolescents include the US, Kuwait and Egypt. Some of the highest increases in the number of obese and overweight children and adolescents have been in China. Between 2006 and 2016, the rate of overweight children in China almost doubled, albeit starting from a very low level. Cambodia, Burkina Faso and Vietnam have the least obese populations. Soft drink sugar tax starts, but will it work?